An homage to the Apennine mountains and valleys, to the landscape’s beauty and to the richness of local culture. 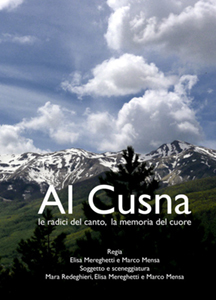 (Mount Cusna, with its altitude of 2121 metres, is the highest peak in the Reggian Apennines). After the production of “In tel fade” we decided to continue the exploration of a fascinating territory, full of history and of tales to be narrated. This new documentary tells of a journey into the mountains, between past and present. The protagonist is Mara Redeghieri, versatile singer of the renowend band Ustmamò. She meets the bearers of tradition, and revisits with them the musical and literary repertoire of the Apennine valleys. Mara dives into the local singing tradition with respect and curiosity, reinterpeting it in a suprisingly modern way.